In this extraordinary memoir, James Beard Award-winning author, Georgeanne Brennan, takes us on an intimate journey to Provence--the place of her early culinary inspiration--where she writes in lush detail about the food, people and French festivals she celebrated during her lifelong journeys through the region. As a young woman, she and her husband, with their small children, bought a farmhouse with a little land and some goats, in hopes of realizing the dream of an idyllic existence in the French countryside. Now, these memoires, documented in A Pig in Provence, are accompanied by forty delicious recipes, gorgeous photographs (many are the author's personal photos) and informative, lively text featuring information about seven of her favorite regional French festivals. In these pages, readers will find rich descriptions of warm summer meals, learning to make goat cheese, discovering regional festivals (or fetes) and more. 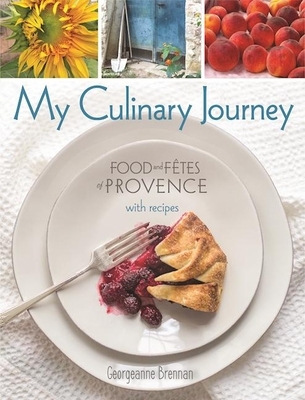 This evocative and passionate memoir weaves together personal stories of friendship, cooking and living in the Provencal tradition, and will whet the appetite of foodies, travelers and anyone who dreams of packing their bags and taking a delicious romp through the lavender fields and vine-covered hills of Provence. Georgeanne Brennan is an award-winning cookbook author, journalist, educator and entrepreneur who is nationally recognized for her work. Her expertise ranges from farming and agriculture to history and food lore. She is the recipient of a James Beard Foundation Award. In 2014 she launched her online store, La Vie Rustic -- Sustainable Living in the French Style, lavierustic.com, which reflects her long-time love affair with France and especially Provence, where she has a home. In addition to her books Brennan writes regular features for the San Francisco Chronicle newspaper's food section and has contributed to Fine Cooking, Bon Appetit, Cooking Pleasures, The New York Times, Garden Design, Metropolitan Home, Horticulture, and Organic Gardening, and is a regular contributor and columnist for Edible Marin and Wine Country. She has been featured in Food and Wine, Gourmet, and Sunset Magazines, among others and has appeared on Oprah.com, Good Morning America, and other shows. She lives in Winters, CA, and Provence.